Nagaur district, in the heart of Rajasthan, is the fifth largest district in Rajasthan state. 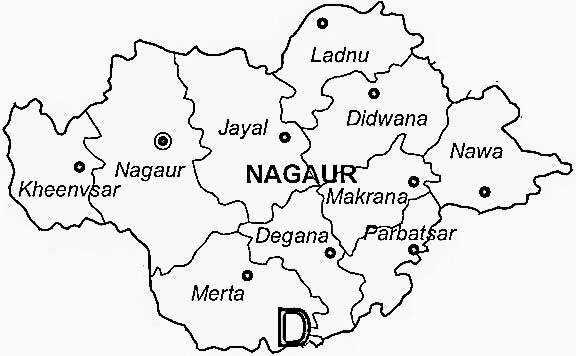 The city of Nagaur is the district headquarters. The district consists 10 tahsils. These are Nagaur, Khinvsar, Jayal, Merta, Degana, Didwana, Ladnun, Parbatsar, Makrana and Nawa. Nagaur is well known for its cattle fair as it is the organizer of huge bullock camel fair “Ramdev Pasumela” every year in the month of February. Nagaur district has got plenty of natural resources like LimeStone, Salt and other type of Stones. Nagaur district is located in Central Rajasthan, with Bikaner and Churu to its North, Sikar and Jaipur on the East, Ajmer and Pali on the South and Jodhpur to its West. Nagaur climate reach to its extremity as hot and dry in summers and very cold in winters. Maximum temperature in summer reaches to 47 C and sand storms are very common for Nagaur. Minimum temperature dips to 5 C in winters. Nagaur railway line is connected to places such as Jaipur, Jodhpur, Bikaner and Delhi. Nearest airport is Jodhpur airport which is at a distant of 140 km from Nagaur. Regular buses are available to cities like Ajmer, Bikaner, Jodhpur and Jaipur.